NOTE: Victim's name also spelled as "Robynn Bradley." 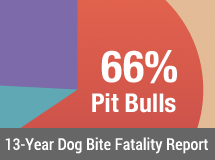 NOTE: Due to the closeness in nature of the Catahoula pit bull dog and the Catahoula bulldog, and the common crossing of them, this fatality was recorded as a pit bull-mix. NOTE: Victim's name also spelled as "Selestino Rangel." NOTE: Victim's name also spelled as "Mary Diana Bernal" and "Mary J. Bernal." NOTE: Victim's name also spelled "Sabin Jones-Abbott." NOTE: On July 22, 2009, the History Channel aired, "MonsterQuest: The Real Cujo." Photos of the dogs involved in the Livingston County double fatal attack were depicted. See related blog post.